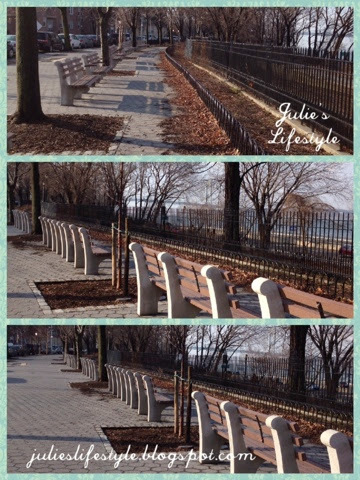 Julie's Creative Lifestyle: Spring Greetings & Crochet! Hi friends! Wednesday was the feast of St. Joseph and to celebrate many people eat the pastry called Zeppole. My father-in-law used to own a bakery in Williamsburg, Brooklyn and he would bake them all the time for this occasion. It's a tradition in my husbands family to eat them and this is the pastry that I shared with my daughter. The pastry is filled with yellow cream and it's so delicious that if you have never tried one you have too! This morning I gave Bosco a walk near the water and here are some pictures that I would love to share with you. Here is what this tree looks like now that it's the start of Spring and this is what the tree looked in the winter and incase you missed that post you can see it HERE. I started crocheting granny squares for an afghan that I'm making for our annual crochet sale at our church that we have each fall. I have decided to crochet the squares together. I'm still working on the men's scarf that I have been knitting and incase you missed that post you can see it HERE. Wishing everyone a Happy Spring and have a nice weekend. I look forward to seeing everyone on Monday for my Makeup Monday Series. Incase you missed any you can see them HERE. Have you made any special plans for this weekend and what will you be doing? I will be sharing at this new blog party that Mary from Go Crochet Crazy is hosting HERE and you might like to join along too. Your pictures are very good and soon all those trees will have beautiful leaves on them. I just did a post on my spring flowers that are going crazy and so much earlier this year. We had no winter - very warm. I purchase a few plants to fill in my pots for color and 4 tomato plants - I just love home grown tomatoes. Have a wonderful weekend - Bosco looked like he liked his walk. Hi Julie, where's all the snow? :) We still have lots of it but at least it has melted a bit. I wish it felt like spring. Looking at your pastry makes me hungry. I think I'll have to find something to snack on although it won't be as good as the one in your picture. All my hooks and yarn were put into storage two weeks ago. I don't know how long they'll be there. I tried to fill the void with drawing but I still really miss crocheting. Your afghan is coming along nicely. Can't wait to see it when its done. Hey Julie, that looks like such a great place to go for a walk. I'm sure Bosco enjoyed it. Isn't it nice to see signs of Spring popping up everywhere. I'm glad Spring is finally here. I love granny square quilts!! Hi Julie, the pastry does look delicious and thanks for telling me all about it as I have never heard about the feast of St Joseph before. Bosco certainly looks like he's enjoying his sunshine walk, you took some really lovely photographs and that tree is such a fine specimen in all it's spring glory. 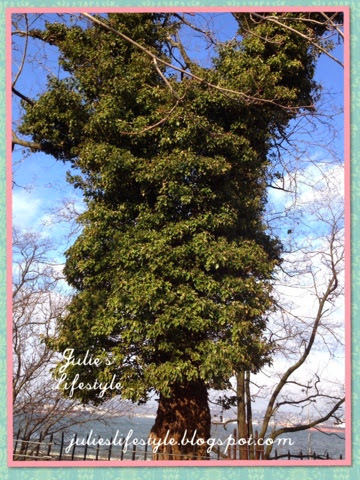 Julie, what a lovely blog post! The pastry looks scrumptious and the spring walk pictures are wonderful. I'm so thrilled springtime has finally arrived! Thank you for sharing your happenings and for linking up for the Go Crochet Crazy Spring Fling at www.GoCrochetCrazy.blogspot.com! Thanks for sharing your pics! Lovely day to walk the dog for sure. I have a black lab. I love to crochet too. When I saw you at Friendship Friday that's what caught my eye. Following you on everything except GFC it wouldn't let me for some reason. Have a great weekend. I'll try again next time. St. Joseph's are my guilty pleasure Julie! Also, Sfingi are amazing too. Luckily they're not available all year round ;). Is that the Promenade in Brooklyn? The pastry looks delightful, and I hope you have a wonderful day! That pastry looks so delicious and where you and Bosco took your walk looked so lovely! Little signs of spring are so wonderful!! Hi Julie: I love it that you like to crochet. My mom taught me one stitch, and when I got older my friend taught me how to do a granny square, but never showed me how to put them together so trying to use the ol' noodle I just kind of did my own. It wasn't the greatest, but it was together. I really wish I could read patterns. I have a new grandson coming in May, and so far I've only made scarves, and lap blankets, and baby blankets. How wonderful it would be if I could make hats and booties. :( As soon as I get time this weekend I'm going to come back, and browse your blog if you don't mine I see some things her you have shared, so I'd like to read them. So nice to meet you again, and have a great weekend. Oh, and that GFC you do know that you can't use them at Wordpress, and I have that I wonder if they finally shut it out all together. I have linky followers, and I had to start all over again, and I had almost 1400 followers I had to give up! :( I'm trying to get it back, but it's a slow process. Okay I'm rambling have a great day! OMG, that pastry looks amazing!!! Thank you for sharing at TTF. Hi Julie!! I've never tried that kind of pastry but I wish I had! Hope your having a happy spring weekend! Love your crochet granny squares and the colors you are using. Can't wait to see the finished blanket you are making with them. So want to try the pastry... I'm teaching myself how to crochet this last past year. following you on all your media stopped by from Natasha in oz link up. Stop by and say Hi..
On Long Island (Nassau County) we get zeppoles at the summer church fair but ours are not filled pastries. They are more like a deep fried doughnut covered with powdered sugar. Oh my mouth is watering. I love these. Great granny squares for your church afghan. Hi Julie! The zeppoles look so delicious! I can't wait to see the finished afghan, I'm sure it will be lovely. Thanks so much for sharing this wonderful spring post at Best of the Weekend - pinned to our party board. Hope you have a happy week! The zeppoles look decadent! The pictures you took on your walk are beautiful and I really like the blues in your granny squares. Bosco looks happy that it is spring, and so am I! I have never heard of Zeppole- I want to try one! Thank you for sharing your post at Treasure Box Tuesday! Tweeted! Bosco is gorgeous. What sort of dog is is he/she? Hi Cybele, my dog Bosco is party Corgi and we think dachshund! He is our rescue dog and he is 6 years old. Thanks so much for stopping by! 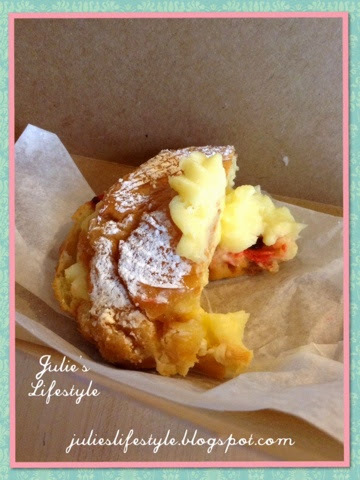 Hi Julie, the pastry is very similar to a portuguese one, that is also delicious! I guess that Bosco loves walk with you in such lovely place. Thanks for sharing the amazing tree! I love the colours of your crochet! Thank you so much for sharing this post at the Say G'Day Saturday linky party! Those pastries look amazing. Such a fun post! Thanks so much for linking! Oh my, I have never tried one but you had me with cream! lol! Enjoyed the walk by the water with Bosco! Thanks for sharing with SYC. There are so many wonderful projects you can make with granny squares. I can't wait to see more of your crochet projects. Thanks for sharing at Inspire Us Thursday on Organized 31. Your walk around the water looked so peaceful and Bosco is so cute! 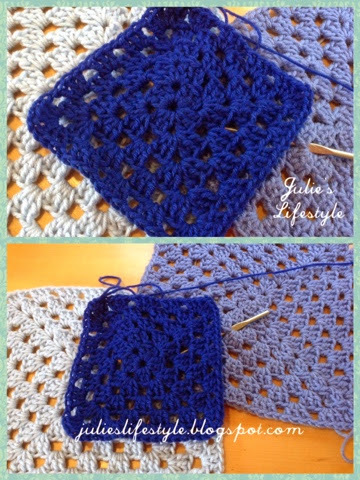 I love the blue you are using for your granny square. Such a bright color. 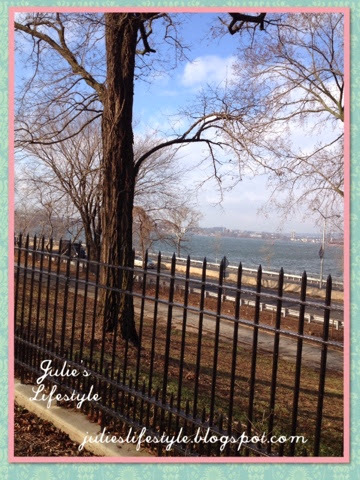 © Julie's Creative Lifestyle: Spring Greetings & Crochet!